An external, gentle, formula to promote healthy skin. The flea packs quite a punch! One flea athlete set the long jump record at 4 feet! They can ingest blood up to 15 times their body weight and start laying eggs 2-12 days after feeding, up to 50 a day! At this point, chances are the carpeting, bedding and cushions are infested as well. What to do? We do not have to look to toxic, powerful chemicals that maybe harmful to our pets, ourselves and our families. 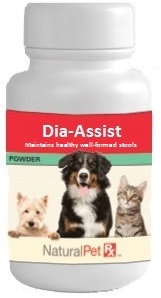 Sprinkle herbal powder, all over your animal friends and then all over your house or apartment. The good news is many herbs emit powerful aromatic and volatile oils, which, while pleasant to us, are overwhelmingly repulsive to many insects, (luckily their sense of smell is far more powerful than ours) and they jump ship and move out. Fresh dried powdered herbs also act as insecticides and repellents (against fleas, lice, ticks, chiggers and mosquitoes) while being non-toxic and effective. Sprinkle onto your animal friends while back-combing their coats, then sprinkle around their bedding or favorite hangout areas as part of your regular household cleaning chores to dissuade further unwanted guests. If the infestation is particularly stubborn, take the fight internally as well. Supplement the diet with garlic powder sprinkled into their food each meal. Small Up to 20 Enough to cover area. Large 40-60 Enough to cover area. EXTERNAL USE ONLY. Sprinkle on coat while back-combing daily. Sprinkle around bedding as part of regular household care.